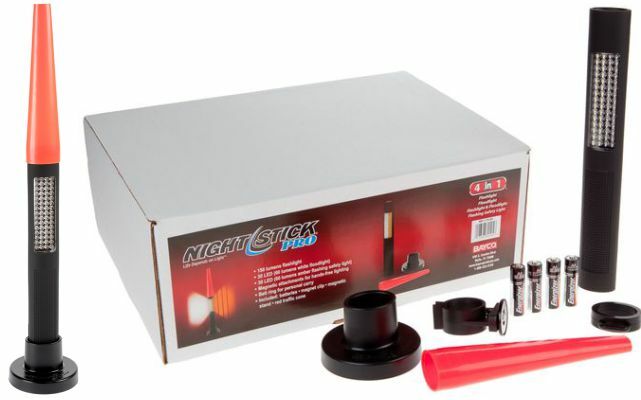 Nightstick 1174 Safety Light Combo Kit - LED - 4AAThe Model 1174 Safety Light Combo Kit includes the Model 1174 Safety Light, the Heavy Weighted Magnetic Base and the Red Safety Cone into a single package. The Model 1174 Safety Light combines a full-size flashlight and a flood/flashing safety light in an all LED compact light-weight package. Two body mounted push buttons control the lighting functions. The top button powers the tight-beam, long-throw 150 lumens flashlight in either momentary or constant-on mode. The bottom button controls the safety light. Pressing the bottom button once, turns on the WHITE safety lights at full-power. Pressing the button a second time, turns off the WHITE safety lights and causes the AMBER safety lights to strobe. Powered by 4 AA batteries (included). For added utility, there's a removable magnetic clip and lanyard ring included with each light. The Heavy Weighted Magnetic Base makes it possible to stand the light up on its own, or attach the light magnetically to any metal object, while the Red Safety Cone turns the 1174 into the perfect tool for directing traffic or marking a hazardous area.